The Combined Protocol for Acute Malnutrition Study (ComPAS) is exploring the effectiveness of simplifying and unifying the treatment of uncomplicated severe and moderate acute malnutrition for children 6–59 months into one protocol. The research is being co-implemented by Action Against Hunger and the International Rescue Committee (IRC), with arms in rural South Sudan and urban Nairobi. This consultancy provided data management support to the South Sudan arm of the study towards the end of the study’s data collection phase. It was to ensure cleaned data was available for analysis in a timely manner and a plan was in place for data storage and access during the analysis phase. Prior to departure to South Sudan, the MEAL team worked closely with the study management team. The purpose of the conversations was to understand the work to be undertaken and to ensure relevant data files and background documentation was provided. In-country, we worked mainly with the ComPAS team (four colleagues) at Action Against Hunger’s base in Malualkon. The work entailed cleaning the data that had been collected, and an investigative approach was adopted to support routine data quality checks. Paper forms had been used to collect the data and another component of the work was to support the transfer and quality checks of key data (weight, height, mid-upper arm circumference) into an electronic format through a tablet. Another task was to document the filing system in place for the ComPAS paper records. 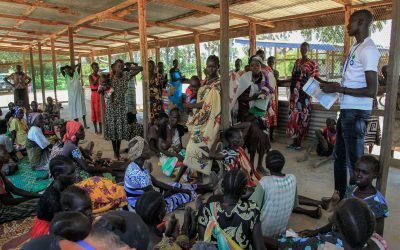 Consultations were undertaken with Action Against Hunger staff in Malualkon and Juba in order to come up with recommendations on the storage of the records in the future.